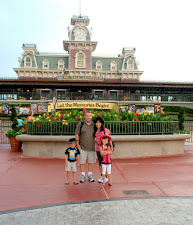 Travels and Wandering: Time for the best DAD! Time for the best DAD! What, it's that time again? TIME really flies so fast isn't it? We are halfway of 2010 already and the number of my age will change next month (lol). Yup, I will be celebrating my birthday next month but this post is not about it. It is about the TIME to celebrate and enjoy the special day for the best Dads in the world. My husband is a loving and super duper caring Dad to our two children. He is the best when it comes to playing with them, telling stories during night time, and helping me do most of the things that I regularly do everyday at home. It's funny because when he retired from the service, his old watch that he's been using for year also retired. 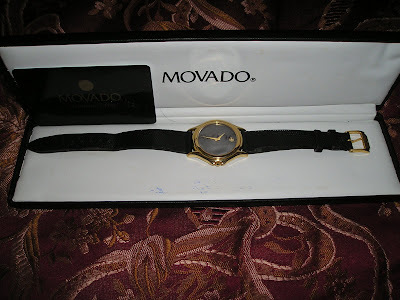 I hope that I could earn more so I could get him a movado watch, his ever favorite brand among watches. The photo above is the movado watch that he bought years ago, it is one of his collection. He seldom uses it and I think, he would be happy if I can get him an additional one. Ahem! I hope I could earn more before Father's day so I could buy him one lol. I found some decent designs at Bluedial and I have three favorite ones just in case I could afford to buy one hahaha. Wish me luck folks! ayay! bongga naman ang gift kung ganon...si hubby d mahilig masyado sa watch...ehehehhe....ala pa akong regalo sa banana ko....alang kita eh....lol! such a sweet loving wife.. kayang kaya yan sis!